The European Union has been one of the main financial supporters of Colombia’s peace process in recent years, and this week it pledged an additional $17.5 million USD (€15 million) to the effort. These funds, according to an E.U. statement, are intended to “scale up concrete actions,” specifically the reintegration of former guerrillas back into society following an historic peace accord signed in late 2016. “The European Union has been at the side of Colombia since the very beginning of the peace process,” said Federica Mogherini, high representative and vice president of the EU, during a Colombia-focused event on Thursday at the Belgium headquarters of the North Atlantic Treaty Organization (NATO). The European Union has provided at least €120 million to peace-building efforts in Colombia since 2012, the 28-member-nation group said in a statement. 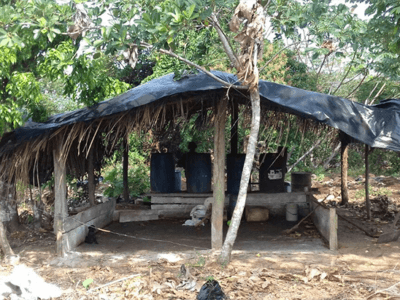 This has largely come in the form of the EU Trust Fund (EUTF), which was formally established in December 2016 as Colombia was finalizing its peace accord with FARC. Over the past 15 years, the European Unions says it has supplied more than €550 million in funding toward peace efforts in the Andean Country. The new funding comes at a pivotal time in the peace process and will be in addition to these previously announced totals and will be made available during the EU’s current 2018-2020 budget for aid to Colombia. Following the peace agreement finalized in December 2016 between the government and FARC, around 7,000 leftist rebels demobilized and turned in their weapons. While the leaders and others who committed grave crimes during the preceding half-century of conflict continue to await justice proceedings, the rank-and-file members of the militant group are mostly free to return to normal lives without their rifles away from the rural, guerrilla-mission-driven life that some lived for decades. 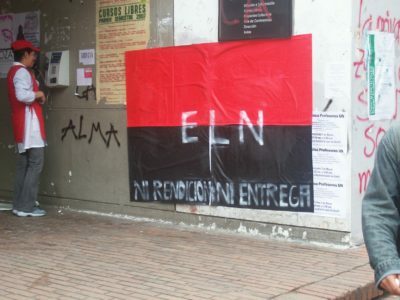 In addition to the hostility many ex-guerrillas have met from other Colombians — at least 40 have been killed, according to the government — many have few personal connections left to family members or the cities where the bulk of the nation’s population lives and economic opportunities reside. Many of those who were recruited to the rebel faction as children have known no other way of life. At the same time, the peace process is at its most fragile. The controversial, nearly-300-page accord includes 558 stipulations and implementation has been moving ahead slowly, with no progress made on more than half of those provisions in the first eight months and only 17% fully implemented, according to a study from the University of Notre Dame’s Kroc Institute for International Peace Studies. While some movement has been seen in the six months since the report was released, many of the key aspects remain stalled in a country highly divided about the peace process. The future of implementation is even more precarious given who is the front-runner in this month’s presidential election. Rightwing candidate Iván Duque is now the favorite, and he has been railing against the peace process for years. The agreement include several major provisions that have caused outrage from the opposition, such as the widespread impunity or short detention terms for crimes and guaranteed congressional seats for the new FARC political party. Other aspects — including rural development funding, social inclusion efforts, and social programs in conflict-ravaged areas — are less divisive but have still not been initiated despite the current president and a majority coalition legislature being supportive of the peace process. The future of implementation is even more precarious given who is the front-runner in this month’s presidential election. 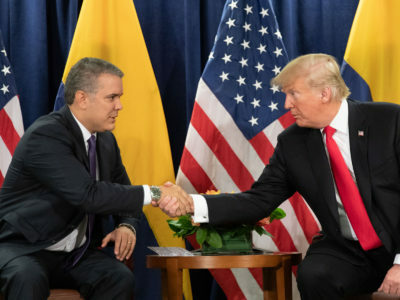 Rightwing candidate Iván Duque is now the favorite to become head of state, and he has been railing against the peace process for years as the protege of former President Álvaro Uribe, the loudest voice in opposition to the agreement with FARC. Duque has pledged to undo significant aspects of the accord if he wins on June 17. The EU announcement came during the Brussels stop of Colombian President Manuel Santos’ trip to Europe last week. The main purpose of the trip was to formalize Colombia’s recent approval to enter the Organization for Economic Co-operation and Development (OECD), a major achievement that Santos’ had been seeking since the early days of his eight years in office. In Brussels, Santos was making his first-ever visit to the NATO headquarters for a presentation on conflict resolution in Colombia and to make an in-person formalization of Colombia’s status of a “global partner” of the military alliance, a standing that was established last year.